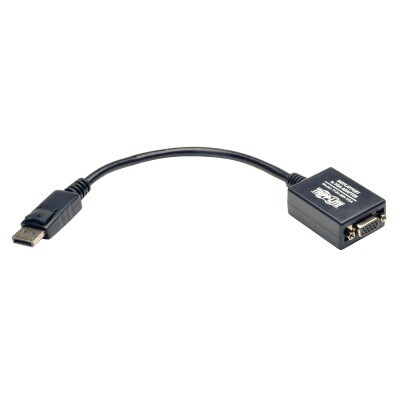 Tripp Lite's P134-06N-VGA DisplayPort to VGA Active Cable Adapter, allows you to connect a computer with a Displayport output to a VGA monitor. It features a simple plug and play design with an integrated chip that converts the digital Displayport signal to analog VGA; no drivers or setup needed. Simply plug the adapter into your Displayport source and connect your VGA cable between it and your monitor. PC video resolutions up to 1920 x 1200 are supported, as well as HD resolutions up to 1080p. Unlike passive adapters, Active adapters convert both Single-Mode and Dual Mode (DP++) Displayport output. It is ideal for use with graphics cards, such as AMD Eyefinity, that do not output Dual Mode (DP++) signals. â— DisplayPort to VGA Active Cable Adapter - 1920x1200/1080P (DisplayPort-Male to HD15-Female) - 6 in.